DAMASCUS — The Vatican’s nunciature in Damascus was hit by a mortar round at 6:30am on Tuesday, damaging the building but neither killing nor injuring any persons. “Given the hour, there was only material damage, not to people,” Vatican spokesman Jesuit Father Federico Lombardi said in a Nov. 5 press conference. The mortar hit the embassy’s rooftop, and, according to The Associated Press, it is “not clear” if the building was targeted. The Assad regime’s news agency, SANA, reported that the mortar shell was “fired by terrorists,” the government’s term for the Syrian rebels with which it has fought a two-year civil war. The Syrian conflict has now dragged on for 31 months, since demonstrations sprang up nationwide on March 15, 201, protesting the rule of Bashar al-Assad, Syria’s president and leader of the country’s Ba’ath Party. In April of that year, the Syrian army began to deploy to put down the uprisings, firing on protesters. Since then, the violence has morphed into a civil war that has claimed the lives of more than 115,000 people. The rebels are fractured among diverse groups, including moderates and Islamists, as well as Kurds. Two weeks ago, Islamist rebels, including al-Nusra Front, an al Qaeda associate group, occupied Sadad, a majority-Syriac Orthodox town almost 40 miles south of Homs. On Oct. 21, the Islamists seized the town, holding Christian families as “human shields,” according to Aid to the Church in Need, to prevent regime forces from retaking the village. Churches were desecrated, and the rebels killed 45 of the inhabitants, including a family of six who were thrown down a well. The Syriac Orthodox Metropolitan of Homs and Hama, Archbishop Selwanos Boutros Alnemeh, told Fides that the Sadad attack has been the “most serious and biggest massacre of Christians” in the Syrian civil war. 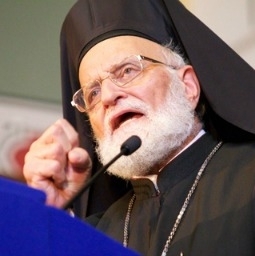 “How can somebody do such inhumane and bestial things to an elderly couple and their family?” Melkite Greek Patriarch of Antioch Gregorios III told Aid to the Church in Need Nov. 4. The Syrian regime retook Sadad Oct. 28, after many of the town’s inhabitants fled the week-long violence, joining the 6.5 million Syrian people who have become internally displaced by the war. In addition, there are at least 2.1 million Syrian refugees in nearby countries, most of them in Lebanon, Jordan and Turkey.